"Sacred gaze" denotes any way of seeing that invests its object—an image, a person, a time, a place—with spiritual significance. Drawing from many different fields, David Morgan investigates key aspects of vision and imagery in a variety of religious traditions. His lively, innovative book explores how viewers absorb and process religious imagery and how their experience contributes to the social, intellectual, and perceptual construction of reality. 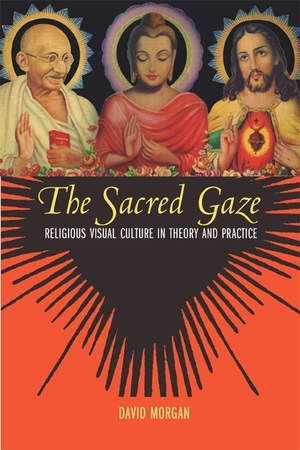 Ranging widely from thirteenth-century Japan and eighteenth-century Tibet to contemporary America, Thailand, and Africa, The Sacred Gaze discusses the religious functions of images and the tools viewers use to interpret them. Morgan questions how fear and disgust of images relate to one another and explains how scholars study the long and evolving histories of images as they pass from culture to culture. An intriguing strand of the narrative details how images have helped to shape popular conceptions of gender and masculinity. The opening chapter considers definitions of "visual culture" and how these relate to the traditional practice of art history. Amply illustrated with more than seventy images from diverse religious traditions, this masterful interdisciplinary study provides a comprehensive and accessible resource for everyone interested in how religious images and visual practice order space and time, communicate with the transcendent, and embody forms of communion with the divine. The Sacred Gaze is a vital introduction to the study of the visual culture of religions. David Morgan is the Phyllis and Richard Duesenberg Professor in Christianity and the Arts, and Professor of Humanities and Art History in Christ College, Valparaiso University. He is author of several books, including Visual Piety (California, 1998) and Protestants and Pictures (1999), and coeditor with Sally M. Promey of The Visual Culture of American Religions (California, 2001).